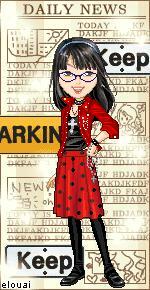 The Morning Star ladies suggested that I go to Chico to the two quilt shops there rather than all the way to Colusa. They said that the shop in Colusa was great, but that it was about an hour away and I would have to travel almost an hour to get back to Oroville. Chico, on the other hand, was about 20 minutes away and on my way back to Oroville. 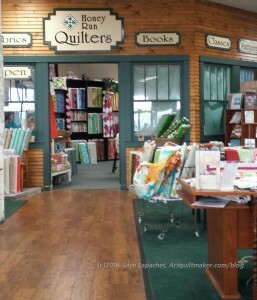 I was started to have enough of visiting quilt shops, but wasn’t quite ready to give up, so I took their advice. Sorry, Colusa! Another time. 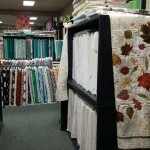 The first shop I visited was called Honey Run Quilters. I have seen this shop’s booth at PIQF and their shop is even better than the booth. 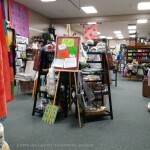 The funny thing about the shop is that it is in Cathy’s Sew & Vac. I have never seen a larger Sew & Vac type shop. This place was the size of a Walgreen’s! Tucked inside was Honey Run. 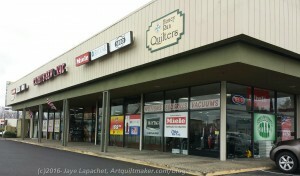 In addition to Honey Run, sewing machines and vacuum cleaners, the Sew & Vac sold barbecues! You could keep your male companion busy looking at those babies while you shop! They also had a ‘husband’s couch’, if your man isn’t into grilling. 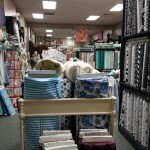 Outside Honey Run were the sale fabrics which were comprised of 3 long aisles of fabric on racks 2 bolts high. These were good fabrics, too, not old crap. They ran about $5/yard. They also had notions, thread and needles outside the actual Honey Run shop. I passed up a lime green flower print from Philip Jacobs, but picked up some low volume prints. I have more than the Carpenter’s Wheels on my mind, I think. I am cursing myself for skipping my man Phil’s flower print, but what can I do? I will use the print on the right in a bag, I think. We will see. At the checkout counter, I asked if I could take some photos and gave them a card. 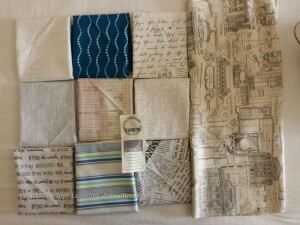 The woman at the counter asked if I teach and I told her that I teach and suggested the Renewed Jelly Roll Race quilt. I have no idea if that will come to anything, but I was very flattered to be asked. I could have bought a lot more. I liked the shop and would definitely go there again. 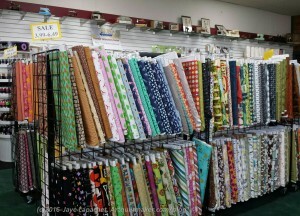 They had great fabric and I would love to go to that shop again. It is so out of the way, I don’t know when I will be by again.